We build machines and automatic work cells for die casting of the light alloys, with a constant focus on excellence, technological innovation, quality and production flexibility. Established in 1969, we provide our customers with our 45 years of experience, acquired in the most advanced industries worldwide, mainly automotive: since our establishment we have exclusively focused on light alloy die casting and gravity casting. We offer prompt and professional service to ensure that our products always work in the best way and last over time, wherever they are. The two platen machine, toggle free, first introduced in 2005, offers a number of advantages: Optimisation of space, more Rigidity, more Flexibility, higher Reliability and Maintainability, Rational design. The three platen with toggle machine has a long traditional consolidated technology, from 200 up to 4400 tonnes of closing force. Italpresse supply automatic work cells that integrate all peripheral devices, from the furnace to automatic deburring with pieces ready for machining. 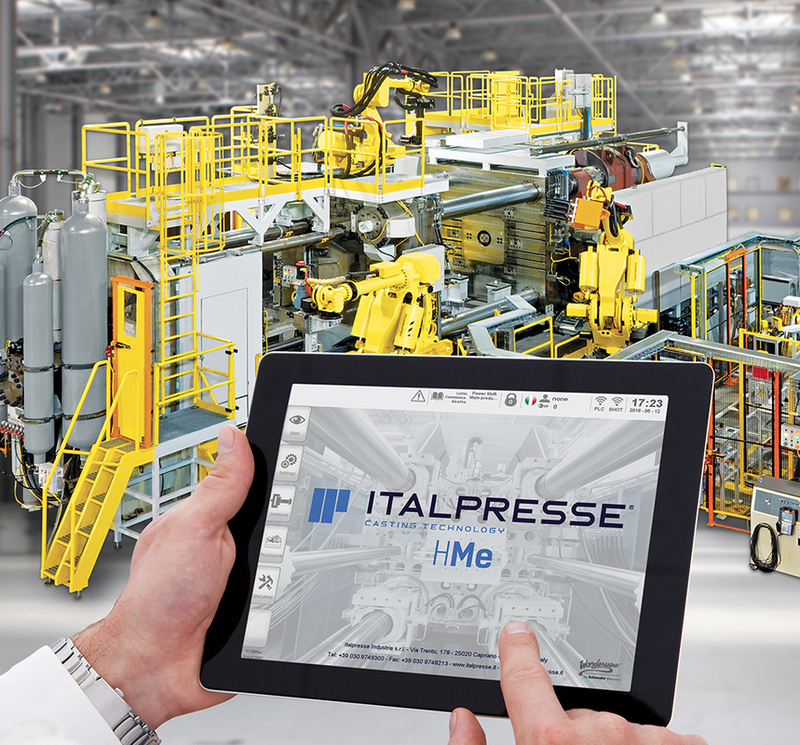 Italpresse has developed a new machine supervision and control system. The new HMe is powered by Wonderware, the global leading brand by Schneider Electric for industrial software including HMe and SCADA. • A greater focus on the relevant information. • A rational new distribution of the information on the pages. • Less strong colours and improved position of the icons, in order to focus the attention of the user only on the useful information. • Intuitive and simple steps for moving from a general browsing to a detailed one, with all the information at a glance. The application is installed on a industrial Pc with Windows 7. • safety is managed with Pilz Pnoz Multi, connected to PLC by Profibus.